IT might feel like he's never been away, but panto favourite Jimmy Osmond heads back to Swansea's Grand Theatre with some of his brothers in tow, for The Osmonds' final tour. They fire up the old hits tomorrow, at 7.30pm, with their Up Close And Personal tour, which is "a great big thank you to all our fans for their love and support through the year", says Jimmy. 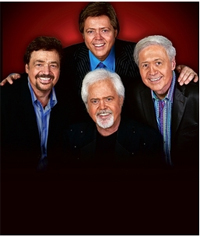 The Osmonds must be the most successful figures of fun in pop history, and though they come in for some stick, it is no mean feat keeping a band on the road as long as they have. Jimmy says: "For the past 20 years I have managed the brothers and produced the events and been the guy that packages the deals, so I have had a weird dynamic with the family in that I am in business with them and yet we are brothers. Jimmy says getting out front and learning to laugh at himself are tools of the trade he learned young. "My family never treated me like the baby because the only girl, Marie, was just before me so she got most of the attention. "I got my share, but by-and-large I have had to earn my stripes with them," he says. And enjoying his first hit when he was just a nipper meant the road has always been his life, while recording independently of the brothers allowed him an identity outside of the family. "We have our rows but by and large we still like each ether, so something good happened," he laughs. And his siblings gave him the best example of how to maintain family harmony, he said, largely by repressing their egos for the sake of the group. "I have seen my brother Merrill, he was the lead singer of the brothers and he had the original hits as a group. "And yet I came along, Donny came along and Marie came along and he has had to step back. "Yet those brothers, Alan, Merrill and Jay were the ones that produced everything we did, so it has been a one for all and all for one attitude. "I kind of look at our brand — The Osmonds Brand — as a General Motors brand — there is The Pinto, there is the Chrysler, I think I'm the Pinto, right? , but it takes all sorts for different ages and different tastes. "I don't know why we are still here." Then he leans in to whisper "We don't deserve it, but we are grateful!"